In the spirit of Thanksgiving, I wanted to break from my two-minute pre-game primer and tell you a personal story about the Packers organization and the city of Green Bay that will hopefully spread some good cheer in this season of giving. 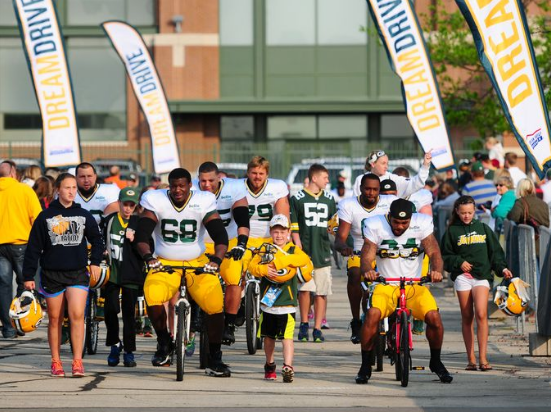 It goes without saying that the Green Bay Packers organization is like none other. The Packers are based on the love of football, the love of family, and the love displayed from its fans. Being a member or fan of the Green Bay Packers is like being a part of a close-knit family that always looks out for each other. These acts of kindness were never more on display then when my friends and I made our annual trek out to Lambeau Field last season. It was at that point that the Green Bay Packers forever became part of our families. This story begins on September 24, 2016, just one night before the home opener against the Lions. My best friend and I were standing on the lower level of the Lambeau Field atrium outside of the pro shop with our good friends from the great state of Delaware, awaiting the arrival of their father and grandfather who would both be attending their first regular season Green Bay Packers game at Lambeau Field. Finally, we could see our friend’s father and grandfather emerge from the crowd with smiles on their faces as we were all reunited at last. We were especially excited that we would all be sharing the experience of “pop pop”, as we call him, watching his first ever Green Bay Packers game at Lambeau Field. Suddenly, as pop pop came off of the escalator, he asked us to walk him to the closest bench because he had chest pains and shortness of breath. We quickly called for the Lambeau field emergency staff as well as EMT’s. Time seemed to be moving in slow motion and we were all in a state of shock. One of pop pop’s grandsons began searching the atrium for the EMT’s that we called, and ended up bumping into Mark Murphy who told him that if they did not arrive in two minutes to let him know. The EMT’s arrived and quickly made the decision to take pop pop to St. Vincent’s hospital for tests and further evaluation. In addition to being concerned about his health, everyone in our group was saddened, and crushed that pop pop would not be able to attend his first Packers game at Lambeau Field the following afternoon. The energy and excitement had left our group and everyone was reeling from the events that had just transpired. We stared at each other with saddened, blank looks while we were out at dinner. One of pop pop’s grandsons decided to skip dinner, and stayed in the hotel. For the first time in our lives, we had lost our all of the excitement of going to a Green Bay Packers game at Lambeau Field. After a quiet night filled with silence, morning had come and gameday had arrived. We all decided that pop pop would want us to go to Lambeau Field and witness a Packers win against the division rival Detroit Lions. Before the game, we all went into the Packers pro shop to try and do something nice for Pop Pop. His grandsons decided to buy him a custom Packers Jersey with his name on the back. While they were embroidering his jersey, my friends explained to the workers at the pro shop the reason why they had bought their grandfather this customized jersey. All of the workers were so touched and moved by the grandson’s love of their grandfather that they gave them a get well card and a beautifully crafted book about the history of The Green Bay Packers to give to their grandfather when they visited him after the game. It is gestures like the ones seen on this trip that makes being a part of the Green Bay Packers family so incredibly special. Complete strangers, display random acts of kindness to family members in need, hoping to put a smile on their face and brighten their days. Meanwhile, back at the hospital, Pop Pop was up to his usual shenanigans of giving the doctors a hard time, as is part of his good nature. The doctors scheduled a routine procedure around the start of kick off so that he would be up and moving around before the start of the game. As expected, The Packers delivered a big win for pop pop and we all celebrated with our friends at Lambeau Field. After the game, we visited pop pop and showed him the gifts that his grandsons had bought for him. It is at that time that he shared with us just how blessed he had been to get to the hospital when he did. Prior to the procedure, he told the doctors that his doctors back at home had been saying that these symptoms were triggered by stress. During the procedure, the doctors at St. Vincent ‘s hospital discovered that these “stress-related” symptoms actually were caused by massive blockages in his main arteries. The doctors at St. Vincent told Pop Pop that if he had actually gone to the Packer game that Sunday afternoon, the excitement from the game, and the exertion of walking around the stadium would have given him a massive heart attack. So what does all of that medical vernacular actually mean? Visiting Lambeau Field saved pop pop’s life. As we all come to the Thanksgiving table this year, we should all be thankful for the little things in life that we often times take for granted. For our group of friends, we are thankful that Pop Pop and his amazing personality is with us for another holiday season. We are thankful to all of the members of the Green Bay Packers pro shop who performed an act of kindness that lifted all of our spirits and showed the true decency and love of mankind. And Finally, we would like to thank all of the doctors and nurses at St. Vincent’s medical center for their attention to detail and world-class healthcare. To you Packer Nation, I would like to wish you all, the happiest of Thanksgivings and hope that you are spending quality time in the company of family and friends. This entry was posted in David Michalski and tagged Family, lambeau field, Pop Pop, Thanksgiving Day, The Green Bay Packers. Bookmark the permalink. That is one heartwarming story! Thanks for sharing! I am a life-long Packer fan thanks to my mother who passed away in 2011. She used to let me stay up late when I was a kid to watch her beloved Packers on Monday Night Football. You are so right, if you are a Packers fan it’s like one big family. Say hello to Pop Pop and glad he is with you for this holiday season and many more!